This Man is Muslin'd Out! I'm not sure that what I have to report today is really progress. A month ago I left off wondering if I should go ahead and do a sloped shoulder adjustment. The general concensus was that I should man-up and go for it. Since I don't have the contrasting fabric for the reverse of the jacket fronts (which I've convinced myself that I really want) there doesn't seem to be a good excuse not to. So, off with the sleeves! Ripping up a muslin is like dismembering a whole chicken. Not my idea of fun. Thankfully, some parts need no adjusting. So I get to keep the wings, drumsticks and gizzard. For those of you new to the sloped shoulder adjustment, here's a very generalized overview. The line of the shoulder is redrawn at a steeper angle starting from the neck edge which remains unchanged. This sets off a cascade of additional adjustments. I decided that the armscye end of the shoulder seam needed to be dropped 1/2". The side seams are now shorter by 1/2", so I've tacked on a strip of tracing paper and redrawn the bottom edge, tapering back to the original line at the center front. A hip rule helps, but one could also just freehand a slight curve here. The sloped shoulder adjustment is something of a paradox. By lowering all the various points, shoulder, armscye and side seam, the final effect is that the fabric is pulled up onto the chest. The upshot of all this? Frequently the neck edge is uncomfortably high. 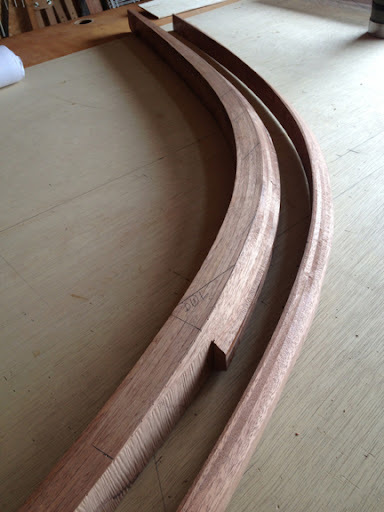 That was the case here, so I trimmed 1/2" off the front neck edge at the center. The "X" (not the smudge) is where the edge of the collar will hopefully align. The back neck also gets raised, but in my case it actually made the collar fit better. So here is muslin #3 worn with a thin shoulder pad. I ran out of the red tablecloth material so forgive the clown costume look. Is it really any better? I'm quite honestly not sure. There may be just a bit too much wearing ease across the upper chest, so I may shave off a 1/4". But then again, a little drape isn't such a bad thing. The shoulder is a little dropped, which wasn't as noticeable when it was a solid color. I don't find it offensive, so I'm not going to start fiddling around with it. After awhile there seems to be a point of diminishing returns with all this fitting. At this stage it's comfortable and wearable. Another muslin and I run the risk of losing interest in the project altogether. That's a sure sign to just move on. The back... ??? I never know what's going on here. Any smaller across the back and it would be a real struggle to put on. And once on, I wouldn't be able to move. I keep telling myself that in the end it will be velvet, and those folds will catch the light, just adding more richness. Right? Just for the heck of it, here it is without any shoulder pads. I'm thinking it could totally work this way too. It's much more shirt-like this way. Trying it this way has also raised the possibility of making my own very minimal shoulder pads. Since they come late in the construction process, I'm just going to leave all my options open at this stage of the game. Sorry kids, but I'm fitted and muslin'd out! To kick start my enthusiasm I went out and picked up some silk thread for basting and some silk pins. I'm ready to start cutting this jacket out, which considering my limited yardage, may prove to be a challenge. I've read that cutting with the nap up gives richer color. Dear readers, please weigh in with your velvet expertise! Nap up or nap down? I don't want to mess this up.